Several patterns struck in gold with new designs were submitted in 1887 for the jubilee of Queen Victoria. Her young head portrait had been used for 50 years since her coronation in 1837. 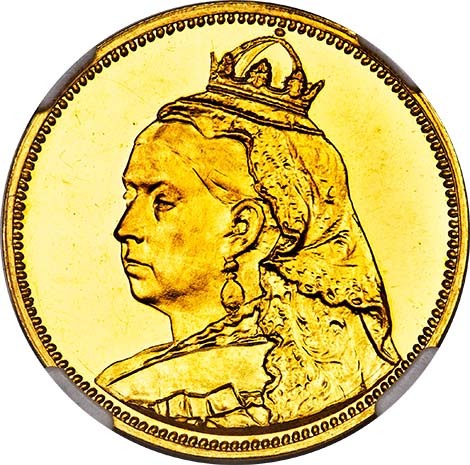 This unique gold pattern portrays a new portrait of Queen Victoria on the obverse. 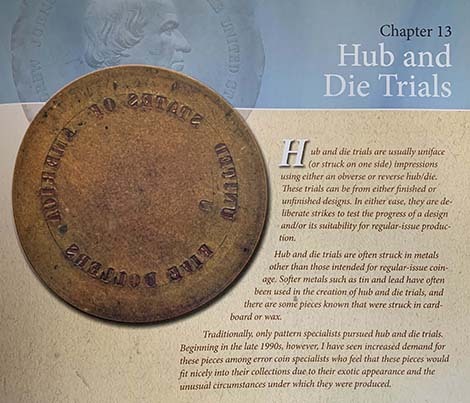 It is technically an obverse die trial and is uniface since there is no design or denomination on the reverse. This unique Great Britain gold pattern was designed by L. C. Lauer, who was a famous German engraver who designed well known gold patterns in 1887 for the Queen’s Jubilee. Lauer had Adolph Weyl present it in 1887 to the Royal Mint as a proposed pattern for the design change. 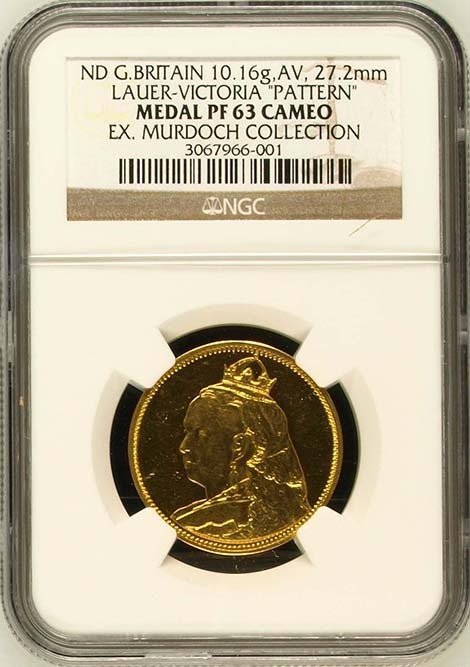 This Proof 63 Lauer gold pattern obverse die trial is unique since it is only of Queen Victoria’s portrait. There is some speculation that this gold pattern was intended for a Florin, Half Crown or Penny, each with a diameter of 29.5mm or more. 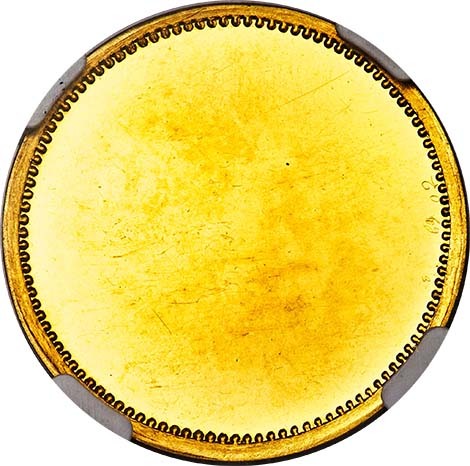 Many experts believe that this pattern was intended for a gold 2 Pound design since the diameter specification is 28.4mm which is the closest size to this pattern of 27.2mm. This piece is considered unique from 1887 due to the design and is almost identical to other patterns Lauer struck for the 1887 portrait change. It was intended for one of four denominations but is closest in diameter to the gold 2 Pound. In the reference book used by PCGS and NGC, English Pattern Trial and Proof Coins in Gold by Alex Wilson and Mark Rasmussen, Lauer’s gold patterns for 1887 are photographed, attributed and assigned W&R numbers. This includes W&R #378 on page 433, which is an undated obverse pattern (1887) for an unspecified denomination, also by Lauer, with a very similar portrait of Queen Victoria. Also listed and plated in W&R is #371 on page 426, a gold Crown pattern of 1887 that was designed by Lauer for the jubilee of Queen Victoria. There are six known and one just sold in a Heritage Auction for $156,000. 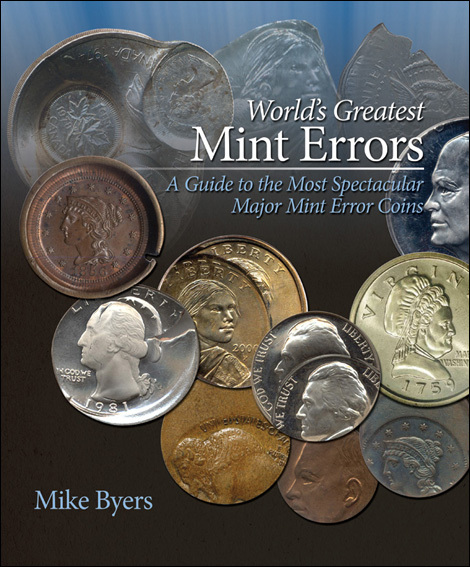 W&R lists several other gold patterns designed and struck by Lauer for the reverse design and some with both the obverse and reverse design including (3) 6 Pence patterns, (3) Penny patterns, (2) 1/2 Penny patterns and (2) Farthing patterns. W&R #394 on page 450 documents a uniface obverse pattern for an 1887 Penny, also by Lauer and is 31mm. There are other Lauer gold patterns for the 31mm Penny that are uniface as well (BMC-2137, BMC-2172). Lauer is famous for designing and producing well known gold patterns for Queen Victoria’s Jubilee for Spink & Son in 1887. The highest price recorded for a Lauer Great Britain gold pattern in auction for an 1887 design is a gold Crown (ESC-342A), also pedigreed to the Murdoch Collection of 1904. It realized $235,000 and is considered one of only two known. Also sold in auction was a small 1887 gold 6 Pence pattern Rarity 5 (6-10 known) that was designed by Lauer (W&R #381) which realized over $17,000. Also sold in a Heritage auction was an 1887 Victoria pattern gold Penny, also by Lauer, W&R #392 for $20,562 with 3-5 known. This gold pattern by Lauer, pedigreed to the Murdoch collection in 1904, is not listed in any reference book and was auctioned by Sotheby’s in 1904, lot #541. This lot also included an 1887 pattern Farthing in gold. There were seven sessions of the sale of Murdoch’s collection, featuring unique gold and silver British patterns and die trials which even one hundred years later is regarded as one of the most famous British coin collections ever assembled and sold. 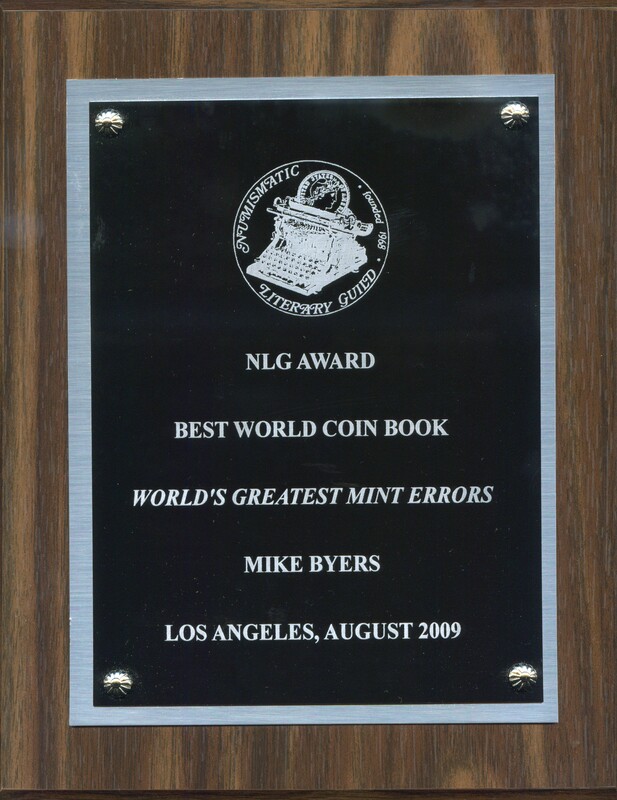 NGC authenticated and certified this gold pattern as Medal PR 63 Cameo, since the exact denomination is unknown. The insert documents that it is designed by Lauer and is from the world famous Murdoch Collection of 1904. This unique gold pattern belongs in a world-class collection of British gold coins, or pattern and die trials or in a collection of unique numismatic rarities. This coin stands alone as a unique part of the history of Great Britain’s coinage during the reign of Queen Victoria from 1837 to 1901.